(CNN) -- Iceland's ruling coalition resigned Monday, three months after the collapse of the country's currency, stock market and several major banks, and following months of public protests, Kristjan Kristjansson, a spokesman for the prime minister told CNN. 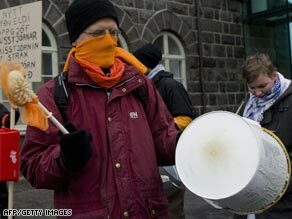 Anti-government protesters in Reykjavik celebrate the resignations. President Olafur Ragnar Grimsson officially accepted Prime Minister Geir Haarde's resignation but asked him and other Cabinet members to continue in an interim capacity until a new government can be formed. It was not immediately clear when that might happen, but last week Haarde -- citing illness -- said he would not seek re-election. Monday's developments followed weeks of demonstrations in the streets, and a weekend of meetings in government chambers as the two parties in Iceland's governing coalition grappled with the financial collapse and its aftermath. Protests have been staged regularly since the collapse, but Saturday's was one of the biggest to date, Kristjansson said. Saturday's demonstration was peaceful, he said, but riot police intervened during protests earlier in the week, using pepper spray and arresting some demonstrators. Haarde announced Friday that he has a malignant tumor on his esophagus and would not run for re-election as chair of the Independence Party. Senior government officials from the two parties that make up Iceland's coalition government -- the Independence Party and the Social Democrats -- met Sunday to discuss the government's future after the commerce minister resigned. The minister, Bjorgvin Sigurdsson, said the government had failed to restore confidence in the three months since the financial crisis began in October. In his resignation letter to the prime minister, Sigurdsson said he was taking his share of responsibility for the economic situation in Iceland. But he also said that there were many more who shared responsibility, Urdur Gunnarsdottir, spokeswoman for the Ministry of Foreign Affairs, told CNN. No other officials were named. Before resigning, Sigurdsson dismissed the head of the country's financial supervisory authority, and he requested that the entire board of the agency resign. The president will next meet with the leaders of Iceland's political parties to find out what type of government they think should be formed. Grimsson will then give the task of forming a new government to whichever party he feels best suited to do that. The chosen party will then try to form a new coalition government. If unsuccessful, the president will give the task to another party. If all attempts of forming a new government failed, the president would call for new elections, Kristjansson told CNN. Iceland's financial system and currency collapsed in October after a series of bank failures, prompting the International Monetary Fund to intervene. Iceland sought IMF help after its government was forced to nationalize three banks to head off a complete collapse of its financial system. Trading on the country's stock market was suspended for nearly a week, and inflation jumped to more than 12 percent. The IMF announced in November it would pump about $827 million into the Icelandic economy immediately, with another $1.3 billion coming in eight installments. Iceland's Nordic neighbors -- the governments of Finland, Norway, Denmark and Sweden -- announced they would lend Iceland another $2.5 billion. CNN's Per Nyberg in London contributed to this report.